We have created our Gigajam wordle. Click on the picture to: see the full screen version, print, copy and embed in your own page. Following the completion of successful discussions, which started at the British Education Teaching with Technology show in London in January 2010, Gigajam has appointed ETC Edutech to represent the sale of Gigajam products in Hong Kong. Gigajam will appear in the 2011 Catalogue for ETC Eductech and will be represented by the company locally. Gigajam have added ‘The studio’ to its Online Music School. The Studio is designed to support the use of music technology in school as part of Gigajam’s vision of the Music Classroom for the Future. 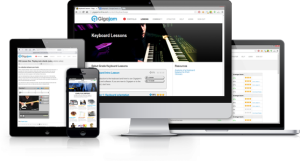 The elearning partnership with Gigajam and Yamaha was launched at BETT in January 2010 and is the perfect partnership of; Gigajam’s digital curriculum for the guitar, bass, keyboard and drums and Yamaha’s great range of portable and affordable MIDI instruments. The concept of creating new musicians with the digital curriculum and interactive musical instruments, means that students, in the classroom can Learn to Play. They can then Perform in a Band by applying their skills to playing live . The next step is to then take the developing musical competence to compose & record which is where Steinberg’s unqiue suite of desktop recording applications come in. The studio environment we have created comprises of a downloadable version of Steinberg’s Sequel 2 which can be downloaded and installed and used freely for up to 45 days. Download and install Sequel 2. There are details instuctions to ensure simple installation. This 10 minute video tutorial introduces you to Sequel 2 and will provide you with the building blocks to start recording and composing. In this lesson there are four videos designed to support you making the most of your harware controller. These two video tutorials outline how to use your computer keyboard and mouse as virtual controller keyboards. This video tutorial shows you how to work out the tempo of an given piece of audio. Here we outline how to use track icons to make your project easier to navigate. Learn about freezing a tracks effects to free up CPU power. Discover the new Media Bay and how to use it effectively. Learn how to apply an effect to an audio clip, in this example we use the Reverse Clip effect. We are looking to develop the studio offer with Steinberg and expand the depth and range of Music Technology tutorials on offer. Steinberg are planning the release for an innovative new unlimited site licence for schools which will make using high quality desktop recording available at school and at home in an affordable plan. Details to follow soon. Gigajam VLE is now accessible to all Bolton Schools using Bolton’s learning platform. Teachers and pupils simply need to login to Bolton’s learning platform and, from the Learning Links, follow the Gigajam logo. Gigajam is using single sign on technology and have developed access with partners Uniservity who are authenticating users. The first time a user logs in they will need to create the simplest of account forms on Gigajam VLE; thereafter users will be simply logged straight in from the Learning Link. Teachers can gain access to Gigajam’s assessment for learning engine functionality, which provides a staff room where teachers can create classes of students, monitor pupils work and leave feedback. Access to the recently launched Arts Award Programme of Study is included. Teachers just need to log in and create an account and then send an email to brian.greene@gigajam.com . We will then convert your account to a teacher account. For more information and technical support please contact Brian Greene at Gigajam brian.greene@gigajam.com . For Bolton teachers wishing to discuss their involvement with the project then please contact Wendy Austin, Bolton Learning Platform Team wendy.austin@bolton.gov.uk. The Music Technology Suite was officially opened on Friday 12th June 2009 by the Lord Mayor of Stoke-on-Trent. 26 x 2 ½ hour Family Learning Workshops – Strum it, Bash it and ICT it! 2 x Full Day Family Learning Workshops – Strum it, Bash it and ICT it! This has resulted in over 700 participants, of which over 500 were young people and over 200 were adults. Which aspects of the workshop were most useful? The fact that my talent in music came to light! The session has brought me closer to my daughter as well as achieving some of my aspirations! Further, I’m more musically aware and slightly less musically aware and slightly less musically challenged!! Did you gain any benefit from attending the workshop that you had not expected? Yes, it has renewed my passion for music. Would you be interested in further workshops? Gigajam have today launched their Programme of Study for Bronze Arts Award. Pupils will now be able to receive a Level One qualification for learning to play a musical instrument with Gigajam. Employers, universities and colleges know that Arts Award is a qualification that shows your level of commitment and progress in the arts, and in developing new skills. Doing a Bronze Award with Gigajam means learning to play an instrument, going to a music event, and finding music heroes or heroines, researching their stories, and discovering how they got to where they are today. Students will also share skills by helping to run a workshop or by giving a demonstration to others. Students build a portfolio of ideas and activities on Gigajam’s Online Music School, http://GigajamVLE.com. The Bronze Award will usually take students about 40 hours to complete. Brian Greene, MD of Gigajam said, “It is an exciting development for us and our client schools, as their pupils can now receive a nationally recognised qualification for learning to play an instrument with Gigajam. There are plenty of pupils out there studying with Gigajam who can demonstrate their hard work and commitment and I am delighted that they will be able to work with their teachers/advisors to be properly recognised. I am sure that most parents and pupils would expect that a music curriculum would include the chance to learn a musical instrument and with Gigajam it is possible to bring instrumental tuition into the classroom, as well as for extended school activities. Learning an instrument takes a good deal of time and I would like to see the hard work of the pupils and the determination of the teachers rewarded. In responding to the Henley Review on Music education, we sought to present the case for technology, as part of a solution, for a music education system that delivers excellence, in the practice of opportunity and, in higher levels of attainment. We, as a private sector contributor to music in the state sector, are encouraged by our partners, which include: Yamaha, Steinberg, ilearn2play and Pure Solo, to state that the opportunities presented by digital learning need to be better understood. We hope that the review will acknowledge that our curriculum for music could do more to deliver the aspiration, that every child should have the chance to learn a musical instrument, if we integrate technology in support of our skilled music workforces. In the same way that we explored how Gigajam provides some of the solutions to the problems, in music education, identified by Ofsted’s Making More of Music report, we have looked carefully at how Gigajam contributes to harnessing technology in education. Below, we have taken BECTAs priority targets, for the use of technology in teaching and learning, and responded by stating how Gigajam can contribute to the achievement of those targets. Follow the full multi-media lesson, using the narrated text, interactive diagrams, videos and play along interactive software. Interact with the lesson using the videos only version, encouraging imitation and modelling. 2. Students can perform together as a band at the end of each lesson allowing them the opportunity to demonstrate their progress and develop their individual instrumental skills into enssemble skills. eg; Watch Gigajam in action here at Bradley Stoke Community School. At the end of this, there second lesson, they come together and apply the skills they have learned to play, as a band, in a Live Performance Workshop. 3. Students can access the materials via a browser and continue practising out of lesson time. Personalised learning space/ e-portfolios Each lesson contains small learning chunks, each of which has an exercise for the student to practise. Students use our simple interactive software (Xtractor) to support them practise and record their performances.eg Have a look at the learning chunk here in lesson one of the drum course:http://gigajamvle.com/content/lessons/edsLesson001/2.htmlStudents can listen back to their performances in Xtractor, as well as receive a graphical readout of how they performed comparing to how they should have performed.eg; How Gigajam workshttp://schools.gigajam.com/videochannel.aspx?id=8When happy with an attempt, they can upload their performance, directly from the software and store in an online portfolio. The protfolio utomatically scores their performance (%) and shows achieved both in terms of quantity and quality. Students can also link video, audio and documents to each exercise to show further learning. Use of technology in personalised learning – more flexible study Gigajam can be used at anytime, and broadly, anywhere there is a browser connected to the internet. It can be used:1. In class within the curriculum2. To support instrumental tuition with visiting instrumentalist specialists3. As part of extended days/after school clubs/community learning/family learning, etc4. At home. Flexible-learning resources Gigajam can be accessed in a number of ways to suit the learner, as detailed above and is also personalised so that students can see where they are in their studies.The assessment for learning engine enables teachers to communicate with students and provide commentary on students progress. The quantity and range of resources available to teachers and learners Gigajam is a great example of a high quality eLearning resources and interactive technologies. Help students to move on in their careers Gigajam has an accredited programme of study that will provide Level One NQF Bronze Arts Award.These can be used as evidence of achievement for progression into FE/further study.Completion of the Gigajam courses meet the entry requirements for the 1 Year Foundation course at the Institute of Contemporary Music Performance [www.icmp.uk.com] . Good quality ICT training and support package for practitioners – a new understanding of the pedagogies appropriate for a 21st century education system. Gigajam provides training days which address the learning and teaching, and technology issues associated with delivering Gigajam in a school. Many of these are fundamental to delivering personalised learning via elearning materials. At this years British Education Teaching with Technology conference, Ian Wright presented a 30 minute seminar on his use of technology for music. He wanted to help students’ engage more fully with the music curriculum, learn a musical instrument and succeed at music. We have transcribed the contents below. Ian says, “Let’s imagine that you are bit nervous and you are; in a big class and you have been to primary school and sung in assemblies and then you come along in year 7 and start at your high school. You have one hour a week and you are expecting, as a music teacher, for your students to take an option of going on to Key Stage 4 in music. So what skill have you given them? What confidence have you given them, to enable them to make that decision and take that choice? So, I was looking at package that would help the students; follow their progress, help them develop a sense of their independence, in their learning, give them responsibility for their progress, as well as give them the skills they would need to go on to KS4 and succeed. Most childrens’ experiences are limited to, perhaps, not always, but perhaps, a bit of keyboard work, or, a bit of samba drumming. I wanted something more than that though, which would give them skills to step outside of the classroom and keep going. “I am Ian Wright, Head of Music at Tiverton High School in Devon. Its a high school of 1300 pupils 11-16 and we started using Gigajam around 4-5 years ago. At that time we had very few children learning a musical instrument and I was very aware that there was a large number of children that were not engaging with the curriclum. They weren’t really succeeding in music and I wanted to find a way to support every child in the classroom, find a way that we could help these children engage with the curriculum and help these children learn a musical instrument, so we looked to technology and found Gigajam and started to embrace Gigajam. If you feel that your students would benefit more from the music curriculum, if they had more instrumental skills, then perhaps this is a good time to consider how using Gigajam could help you to support more students learn to play a musical instrument. 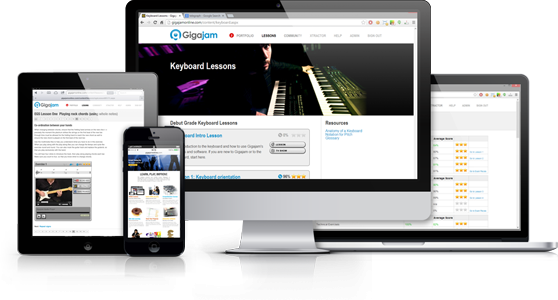 Gigajam’s award winning Essential Skills Courses for guitar, bass, keyboard and drums can now be delivered online to students at school and at home and provides each pupil with an e-Portfolio to store their work and online classroom reporting for teachers. With funding under the spotlight you may be interested to know that Gigajam is just £1 per pupil per annum and can be purchased for just one key stage, making it affordable for the smallest music department budget. We also offer discounts for longer licencing, providing security and legacy for your programmes of study.